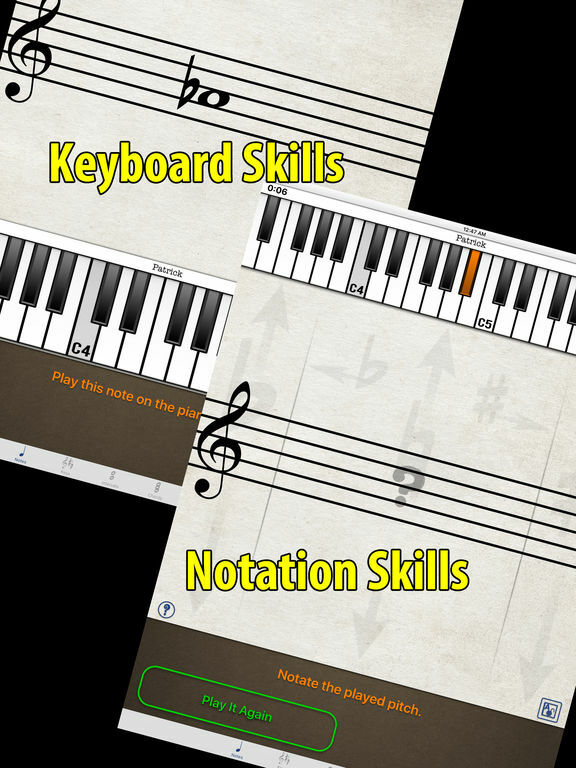 A suite of five modules; Notes (Notation / Keyboard Knowledge), Keys, Intervals, Chords, and Rhythms (Time Signatures), to test basic music skills. Includes an additional 'Grades' module that lists all saved quiz results. 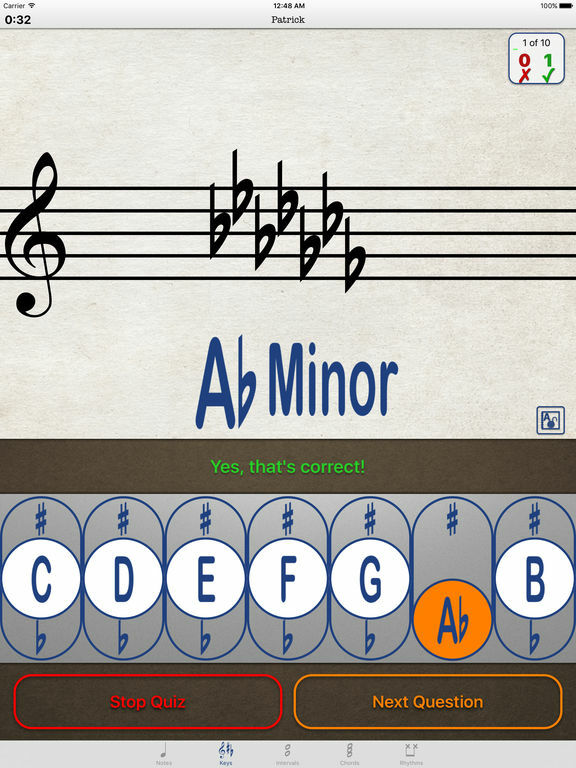 • Read written pitches and play them on the piano, or notate a played piano key in your selected clef. • The quiz note range can be set from 0 to 4 ledger lines above and from 0 to 4 ledger lines below the selected staff. The quiz won't ask for an already asked pitch until each remaining pitch in the entire range specified has been asked or you start a new quiz. • Set separate maximum limits of sharps and flats for the quiz. • Set only major keys, minor keys, or combine them both into the quiz. • Intervals covered are major, minor, diminished, augmented 2nds, 3rds, 6ths, 7ths, and diminished, perfect, and augmented 4ths, 5ths, and octaves. • Set to include or exclude diminished and augmented 2nds, 3rds, 6ths, and 7ths. • Chords tested are major, minor diminished and augmented triads. • Set how the question is asked; playing normally, rolling the chord up, or rolling the chord down. • Set a random root movement from question to question, or set what the root will be for each following chord. • Test without sound to identify by notation alone, or cover the screen and listen to determine the chord quality. Work on your rhythm skills. From very simple to almost impossible. Sight reading rhythms won't be a problem anymore. • Set a time signature from 2/4, 3/4, 4/4, and 5/4. • Set the number of measures from 1 to 16. • Select from one to three pads - pitches notated on, above, and below the line. • Select the specific combination of note values you want included in the test rhythms: Whole, Half, Quarter, Eighth, Dotted Half, Dotted Quarter, Triplet Half, Triplet Quarter, and Triplet Eighths. 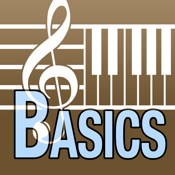 • Include or exclude using rests in the rhythms. 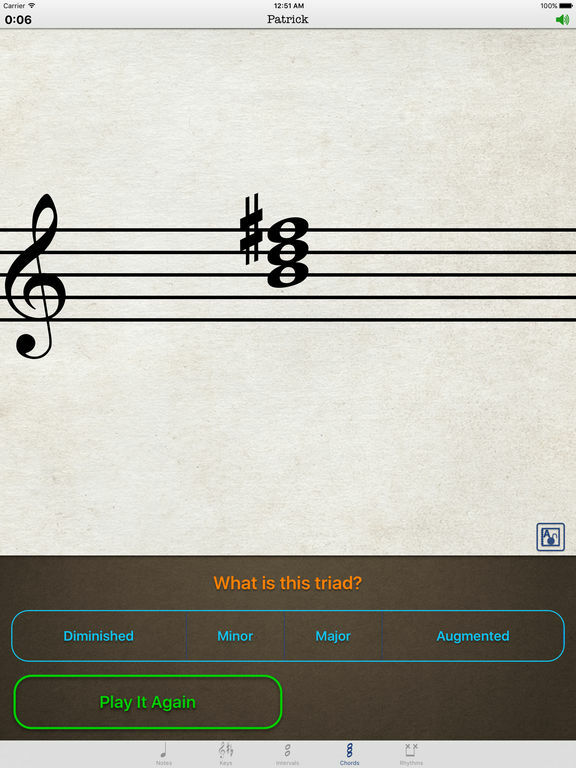 • Exclude grading note durations to better test percussionists or to focus on accuracy alone. • Listen to the rhythm as many times as you want before and after you attempt playing it. • Change the tempo between each listen or attempt. • Record up to three attempt's markings on the rhythm display. • Attempt the same rhythm as many times as you want. • A list that contains all saved quiz results. This list is filterable by student name. You are able to delete selected scores, or all scores at once. Access to the list can be password protected by entering a password in the iPad's Settings App. • The recorded grades include the student's name, date and time the quiz was taken, all relevant quiz settings (clef, number of questions, note values included, etc. ), and score (percentage and letter grade). Use the timer to set an amount of time to work on a specific skill. 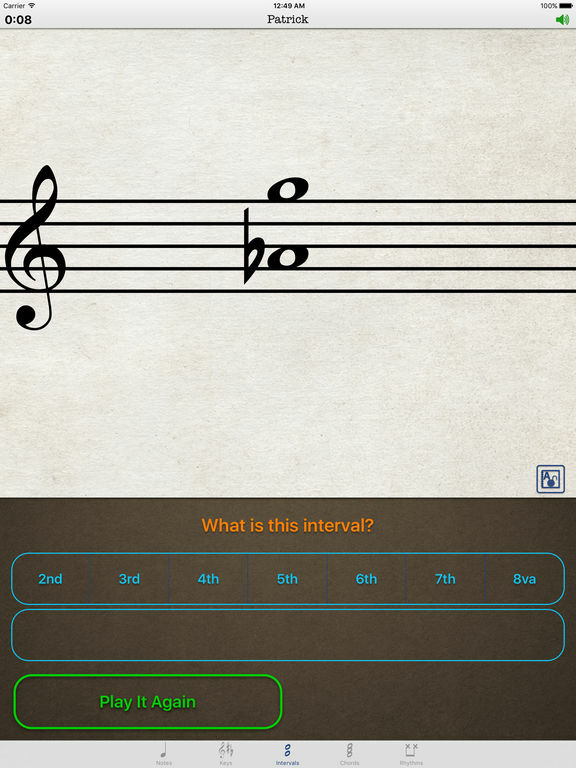 Have a student work for 3 minutes on key signatures and see how well they do. (grade only those questions answered, with the timer on) When they save the score it will show the timer information, number of questions answered, with the date and time. See website for more examples.